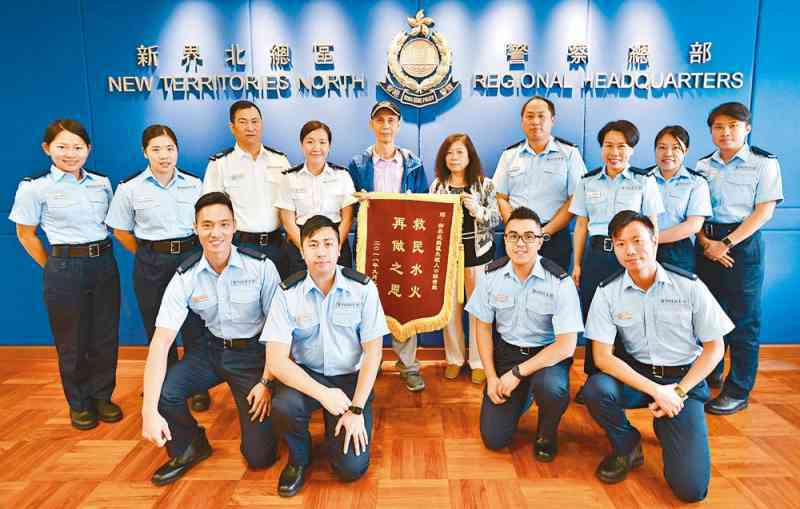 A member of the public, Mr Mak, presented a tapestry flag to Senior Inspector of Regional Missing Person Unit of New Territories North (RMPU NTN) Yeung Siu-fong and her teammates on October 31 in appreciation of their efforts and professionalism in locating his son. On March 12, Mr Mak reported to the Police that his son with mental illness and requiring medical treatment was missing. RMPU NTN followed up the case and found that Mr Mak's son had gone to the Mainland. They then sought the assistance of the Mainland Public Security Bureau (PSB) through the Liaison Bureau. The PSB confirmed that an unidentified man who was receiving treatment at a hospital in Guangzhou was the missing person that they were looking for. With the aid of RMPU NTN, Mr Mak's son was brought back to Hong Kong on September 19.